My writing journey commenced when I took early retirement from teaching and started writing my memoirs in the year 2000. I first wrote in the third person, but as I grew more courageous, I changed the manuscript to the first person. Impatient for recognition, I foolishly sent the memoir off to the big publishers, one after the other. We learn from our mistakes, and after I’d faced rejection after rejection, I put my manuscript aside and concentrated on writing my husband’s life. I wrote from his point of view. Here again, I made another error and after just one rejection, I sent it away to a subsidy publisher. I trembled with excitement on seeing my work in print. We drove to Portland, Victoria to launch my book, as this is where the major portion of the book was set. I had a radio interview in Brisbane and full-page write-ups in two local newspapers. I did an author-talk in the Portland library. The book-launch proved a success. All our friends turned up and bought books, but the profits failed to cover the cost of publication. Looking back now, although the book brought me much joy and gratification, I should have worked on my manuscript more before presenting it to a traditional publisher. All this was a learning experience. I finally did what I should have done earlier. I joined a writing group. It helped me overcome my bashfulness and taught me how to accept criticism. In fact, I was so impressed by what I’d learned that I joined several other critique groups – some as far away as Bundaberg. I live around Brisbane, but I could send in my work for critiquing, and it was critiqued at meetings. Great! Besides this, I attended several writing workshops and masterclasses. Bundy’s Write Fests are always a source of getting to know people and of acquiring more knowledge. Once, when attending James Frenkel’s Writing Masterclass, at the Brisbane Writers’ Festival, he advised me to first make my name by penning short stories. I love writing novels and short-stories are not my forte. Upon consideration of his advice, however, I used excerpts of my manuscripts and converted them into short stories. The result? Two of them were published in the Carindale Writers’ Seasons’ anthology, and my short story, ‘Hunger’, was selected for publication in the 2013 Redlitzer anthology. The following year, I won Omega Writers’ Inc. Narrative Hook competition, and ‘June’s Death’, another excerpt from my memoir, Heaven Tempers the Wind. 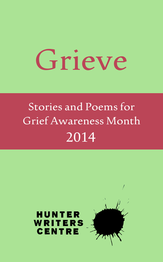 Story of a War Child, was published in the nation-wide Grieve anthology. My short story, ‘Love at First Sight’, has also been Longlisted in the Lane Cove Literary Award Competition. My memoir See No Evil: story of a war child was shortlisted in the Barnardo Great Aussie Book Competition of 2014.
https://hazelmbarker.wordpress.com/ and opened a Facebook account. I write each morning, and encourage beginners like me to take heart and avoid the mistakes I’ve made.